What Is Pectin and What Is It Good For? Pectin is a type of dietary fiber found in fruits like apples, quinces and citrus fruit. It is most famous for its thickening properties and its use as a jelling agent for making jams and marmalade. However, pectin has medicinal value as well. Its natural gelling properties have benefits for the gastrointestinal system, regulating transit time and relieving constipation as well as non-infectious diarrhea. Moreover, research shows pectin exhibits anticancer properties, stopping the spread of cancer cells and activating the immune system to fight the disease. Lastly, the dietary fiber has a detoxifying effect and can potentiate the effects of anticancer medicines. What is pectin? Pectin is a form of dietary fiber, indigestible plant material that passes unchanged through the digestive tract (read more about dietary fiber). It is a type of soluble fiber, as opposed to insoluble fiber, meaning it absorbs water in the intestines and binds to other elements, adding bulk to stools. This, in turn, regulates transit times and encourage more frequent, soft and easy stools. Furthermore, pectin ferments in the colon, producing compounds that appear to be beneficial for colon health. One of its most relevant properties is its ability to make liquids viscous, hence its use for jam making and as a demulcent, for sores and irritated mucous membranes. 1) Relieves constipation and diarrhea. 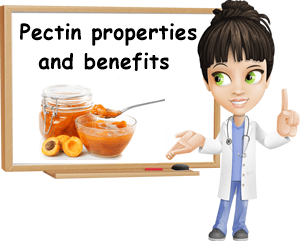 Pectin is a type of soluble dietary fiber, meaning it absorbs water and binds to waste material left from digested food, creating soft, bulky stools. In addition to this, being a dietary fiber, it regulates transit time, resulting in more frequent stools that are easier to pass. All of these effects of pectin on the digestive system help relieve constipation. Moreover, pectin has thickening properties and can help make liquid stools more viscous, or more solid, helping combat non-infectious diarrhea. This is also why apple sauce is one of the best remedies for treating diarrhea naturally. 2) Benefits for hemorrhoids. Constipation causes hard stools that are hard to pass, which can both cause and worsen existing hemorrhoids. Moreover, frequent diarrhea is irritating which can add to the discomfort and inflammation of hemorrhoids, worsening symptoms. Pectin naturally improves stool consistency, benefiting hemorrhoids sufferers. Moreover, its mucilaginous consistency aids in soothing irritation following diarrhea and constipation, further improving hemorrhoids symptoms. 3) Natural prebiotic properties. Research has revealed that pectin ferments in the intestinal tract, releasing compounds that are beneficial for the health of the intestinal mucosa. Moreover, the fiber is a known mucoprotective agent, meaning it exerts a protective action on mucous membranes like the lining of the digestive tract, helping soothe irritation and protect in case of injury. 4) Good for ulcers, sores and irritation in general. Pectin is an excellent natural demulcent, a substance that soothes irritation, relieves inflammation and softens. When you eat apples, apricots or jams and marmalade made from pectin-rich foods, the fiber exerts its demulcent effects on the entire gastrointestinal tract, from start to finish. For example, if you have mouth ulcers, or canker sores, soft, mucilaginous foods like fruit jams or sauces are the least likely to cause pain when eating. If you have a sore throat, soft, mucilaginous foods like apple jam or sauce can be eaten safely, without hurting the irritated throat lining. If you have diarrhea, eating apple sauce will help calm irritation and reduce discomfort in addition to relieving diarrhea (read more about what to eat when you have diarrhea). Also, pectin has been used in beauty products for its soothing properties, to calm irritation. 5) Anticancer activity. Both in vitro and in vivo animal studies show modified pectin from various fruits and vegetables has the potential to inhibit the spread of certain types of cancer by binding to a protein called galactin-3 which is responsible for helping cancer cells spread and metastasize (Anti-cancer activities of pH- or heat-modified pectin). For example, animal studies show modified citrus pectin slows down tumor growth and exhibits a dose-dependent anti-metastatic effect of lung, colon and other types of cancer. Also, by binding to galactin-3 protein, modified pectin has the potential to make cancer cells less resistant to chemotherapy. 6) Boosts the immune system. One of the mechanisms behind the anticancer activity of pectin is its immuno-modulating action. What pectin basically does is activate various immune system cells: lymphocytes, macrophages which eat cancer cells or cells infected with bacteria or viruses, natural killer cells that destroy cancer cells, T cells, B cells etc. This translates into a stimulating effect on the immune system which is believed to play an important role in cancer prevention. 7) Detoxifying and chelating properties. In simple words, pectin helps eliminate toxins. It helps eliminate residual elements from the digestive tract and small amounts of heavy metals, helping detoxify the body and promoting good health. 8) Benefits for cholesterol and glucose levels. Eating pectin-rich foods can help lower LDL (bad) cholesterol levels. Moreover, the dietary fiber prevents lipid peroxidation and the formation of dangerous byproducts, contributing to cardiovascular health. Lower cholesterol levels can have benefits on blood pressure as well. Lastly, some studies show pectin can prevent high blood sugar levels, as part of an overall balanced diet. 2) Quinces (from which the original marmalade was made). 4) Citrus fruit peels (oranges, grapefruit, lemons etc). 6) Berries (strawberries, cranberries, currants, plums, elderberries, blackberries). Pectin side effects. There are really no side effects-proper to pectin. However, it is important to remember that pectin alone is not a superfood and will not treat every disease imaginable simply because it has the potential to help with certain conditions. Also, another important aspect to keep in mind is that, while pectin from fruit jams and marmalade is healthy, the added sugar in these products can cancel its benefits. For this reason, it is important to add as little sugar as possible to your jams and marmalade and simply enjoy them for their unique, albeit not so sweet taste. Just as important, do not cook with honey instead of sugar because high temperatures can result in the formation of dangerous byproducts in honey. Conclusion. Pectin is primarily used for making jams and marmalade, as a food stabilizer and food additive, for making low-calorie food products and as a compound in medicines and skin care products. Moreover, it provides an impressive list of health benefits: it exhibits a strong anticancer activity, has immuno-stimulating effects, detoxifying properties, is soothing on the stomach and mucous membranes in general, helps relieve constipation and diarrhea and is good for hemorrhoids. And you can get your pectin both from eating fresh fruit and vegetables as well as from low-sugar jams and marmalade.